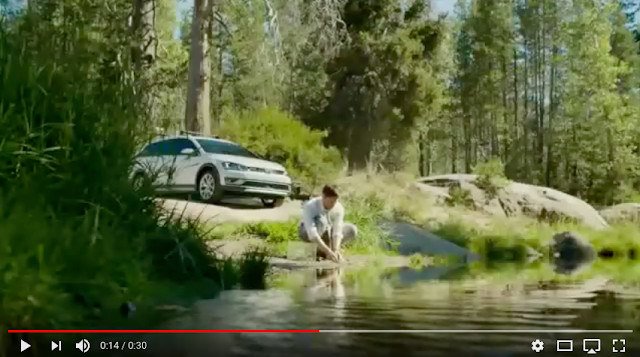 Volkswagen is coming out with a new Golf with some thing called Alltrack that I guess makes it better for driving outside or something, and they're promoting it with a bunch of commercials with terrible crap about wildlife. Here's the first one, where a guy tried to murder a frog. So, it starts with some guy in a glassed-in office who keeps a tropical frog in a tiny, airless glassed-in mini-office because he's a sadist who takes out his feelings of powerlessness on helpless amphibians. The guy goes insane, quitting his job and deciding to release his prisoner as some kind of pathetic act of contrition. Of course, he's an idiot, and tried to release his frog into a river in what looks like northern California. 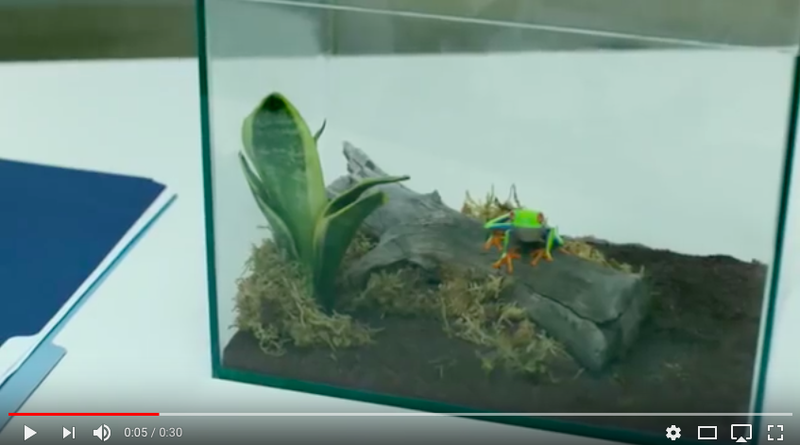 This is a terrible idea, of course, because the frog is clearly a Red-eyed Tree Frog, a resident not of rivers in temperate forests of the American northwest but rather of trees in the rainforests of Central America. It would have died in that river before this moron could even get his key in the ignition. Thankfully, the frog somehow convinces this guy not to abandon it to a watery death, and the commercial ends with the guy driving off with the frog riding shotgun. Or, maybe it was all just a fever dream and the guy in reality is back in his glassy office, convulsing on the floor. Buy Volkswagen! 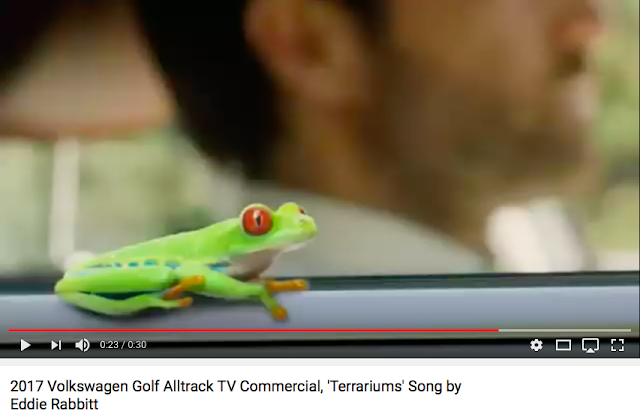 There is another Golf Alltrack commercial I just saw during a football game that had a CLASSIC, an absolutely CHOICE example of the "show a Bald Eagle but play the call of a Red-tailed Hawk" trope. I'll post it as soon as I can find it online. 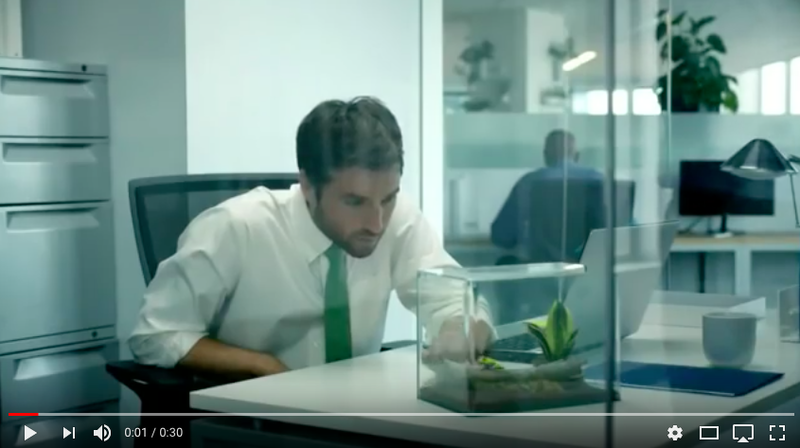 Listen for the Red-tailed Hawk scream when the show the Bald Eagle in the middle of this goddamn awful commercial. Just listen, and weep for the future. The title should be Frogs at Large, surely.